Grunge fans will dig these new books chronicling the music genre, its players and its predecessors. This year marked the 20th anniversary of several seminal events in Seattle grunge history—Nirvana released Nevermind, Pearl Jam released Ten, and Soundgarden released Badmotorfinger, all in 1991—which is why we’re awash in grungy nostalgia. If you’re hoping to keep the dream alive (or wondering what all the fuss is about), dig into these new books chronicling the music genre, and its players and predecessors. Hefty enough to iron the wrinkles out of a flannel shirt, this tome, penned by Brooklyn writer Mark Yarm, traces the emergence of the genre through the voices of the people who experienced it. Constructed entirely from more than 250 interviews with musicians and industry mavens, the result is a cacophonous vocal portrait—which seems utterly appropriate. 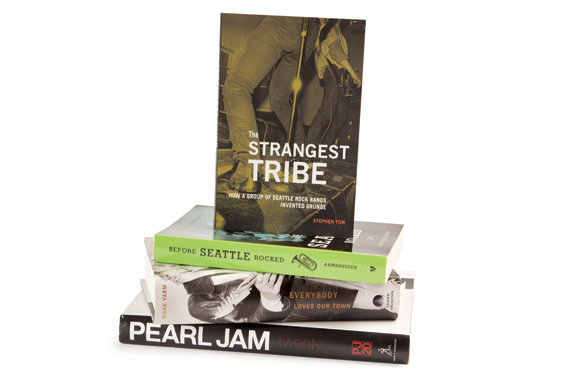 With a forward and interviews by Cameron Crowe (who recently released a Pearl Jam documentary of the same name), this coffee-table autobiography chronicles the band’s career from fledgling to world famous. The graininess (or is that grunginess?) of the photos is made up for by the immense number of them, as well as by the intimate backstage details shared in this comprehensive month-by-month account. Philadelphia historian Stephen Tow searches for the earliest roots of the grunge emergence, tracing local influences from the late 1970s through the ’80s, and ending his timeline—constructed via hundreds of interviews—just as grunge goes mainstream in the early ’90s. This is grunge before grunge was grunge. Finally, for those who prefer to trace local music roots even farther back, Seattle historian and musician Kurt E. Armbruster offers this extensively researched and compelling book. Starting with the native Duwamish tribe, he chronicles the city’s musical past—which is rife with ragtime, jazz, opera, blues, folk, soul and symphonic—and its connections to the present.